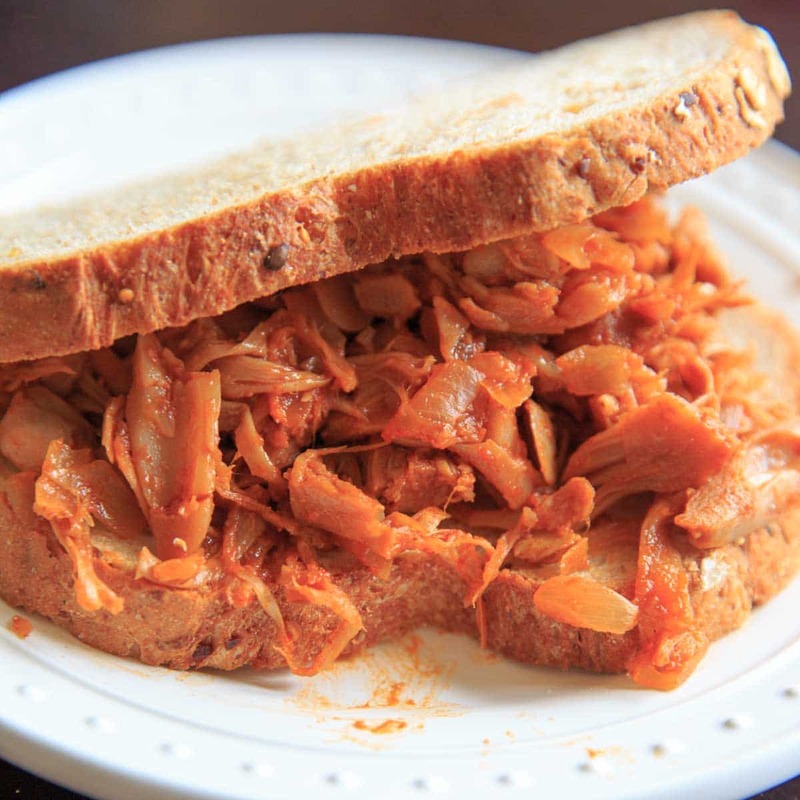 Vegan BBQ Pulled Jackfruit – eat it on a sandwich, in a taco, or by itself! Easy to make and customize based on your favorite flavor bbq sauce. 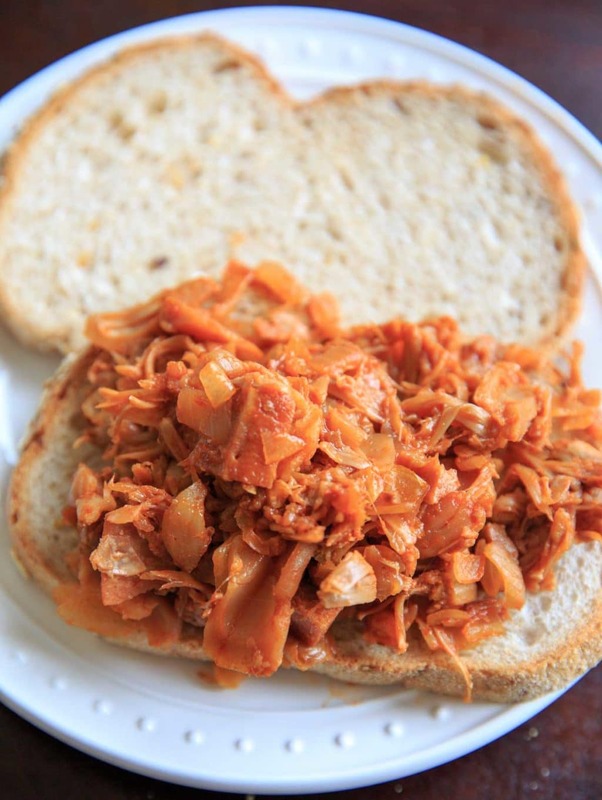 Click here to save this BBQ Pulled Jackfruit recipe on Pinterest! 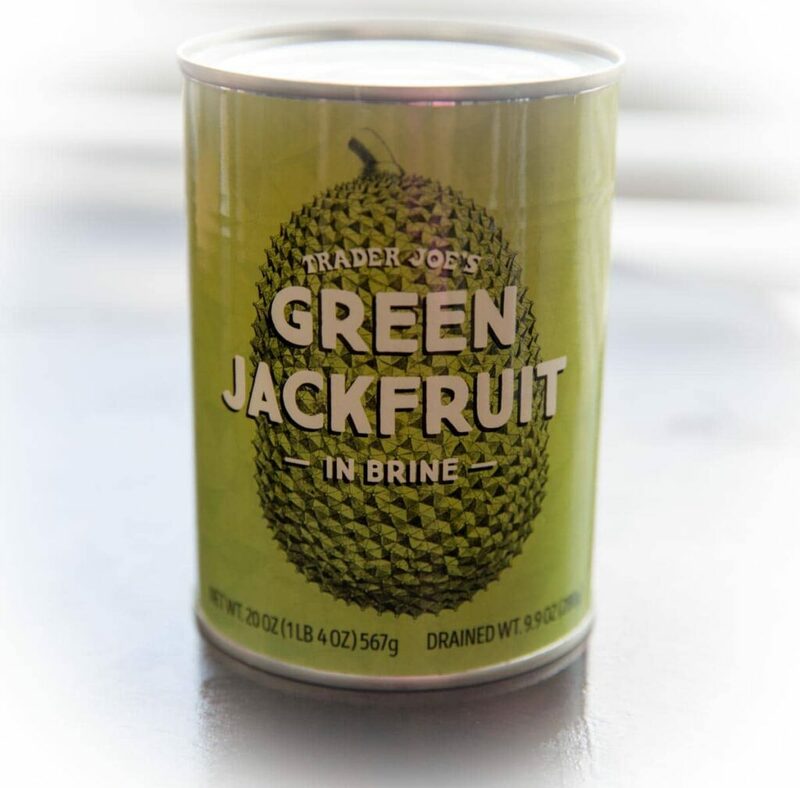 I first heard of jackfruit while at Trader Joe’s, as they sell cans of “young jackfruit” in brine. I bought a can, but had no idea what to do with it. So I let it sit a while. Then when I visited Salt Lake City a couple months back, I had my first taste of bbq jackfruit – in tacos! I had known it was meant as a vegan meat substitute, but I didn’t really believe it until I tried it. From my understanding, fresh jackfruit is not all that tasty. But if you cook it up and add some sauce to it, it is! Also, the texture allows it to be “pulled” like actual bbq (i.e. “pulled pork” or “pulled chicken”). What other fruit can do that?! BBQ meat is big where I’m from (good old North Carolina) so I’m waiting for the day BBQ Jackfruit is offered at one of these southern restaurants. This is one of those recipes where the taste greatly depends on the sauce used. I used a spicy sriracha and roasted garlic BBQ sauce from – you guessed it – Trader Joe’s. Since mine was already spicy, I didn’t add any more spices. But if you use a plainer bbq sauce and find it’s missing some flavor, I like to add some smoked paprika and a tablespoon of apple cider vinegar. Vegan Pulled BBQ Jackfruit - eat it on a sandwich, in a taco, or by itself! Easy to make and customize based on your favorite flavor bbq sauce. Drain and throughly rinse jackfruit. In a medium stock pot, heat olive oil over medium-high heat. Add onion and garlic and saute for 2-3 minutes until onions turn translucent. 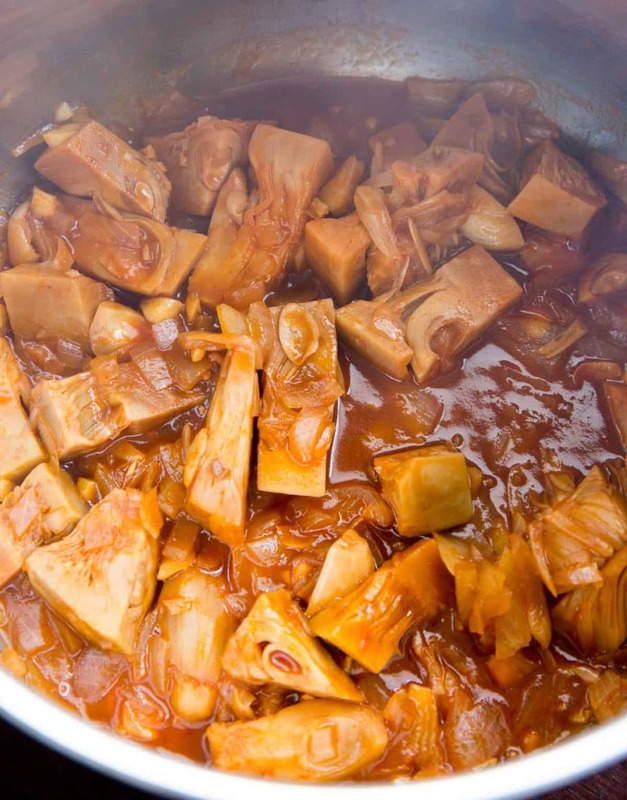 Add rinsed jackfruit, bbq sauce and water to pot and cook for 5-10 minutes over medium heat, stirring occasionally. 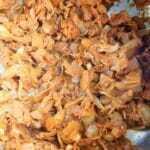 Using a potato masher or large fork, mash the jackfruit to create the "pulled meat" consistency. Add more water if necessary, cover and let simmer for 15-20 minutes over low heat, stirring occasionally. Add more bbq sauce if desired, and serve! Can be eaten by itself, made into sandwiches, or tacos. *Flavor will depend on the bbq sauce you use. Since my bbq sauce was already spicy, I didn't add any more spices. But if you use a plainer bbq sauce and find it's missing some flavor, I like to add some smoked paprika (1/2 teaspoon or so), a tablespoon of apple cider vinegar and/or a dash of liquid smoke. Can’t wait to try this new dish! 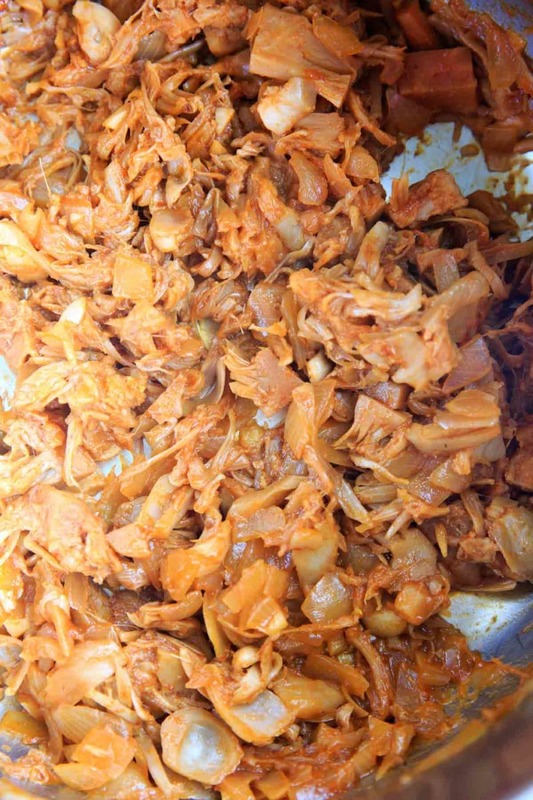 Have you tried substituting jackfruit for other traditional chicken dishes? Not yet, but this was so easy that I definitely want to try substituting in other dishes! I saw a recipe for vegan enchiladas using jackfruit. I want to try it. The first time making BBQ jackfruit, I loved it! Even my non vegan or vegetarian friends said it looked exactly like meat. I had it with rice, and some chopped lettuce to replace the bread, and it was the most scrumptious vegan substitute I’ve ever had that isn’t just soy product! They do offer this in a North Carolina restaurant now! Lol…The Foxes Boxes Restaurant here in Wilmington NC offers Jackfruit Carnitas. I just recently discovered it and it is so good. I just made BBQ Lima beans with jack fruit in my Instantpot. Although it looked exactly like pulled pork and absorbed the sauce well, it was smooshy, the texture of meat was completely absent. So maybe jack fruit doesn’t hold up to pressure cooking?